Carl Anton Larsen (7 August 1860 – 8 December 1924) was a Norwegian Antarctic explorer, who made important contributions to the exploration of Antarctica, the most significant being the first discovery of fossils, for which he received the Back Grant from the Royal Geographical Society. In December 1893 he became the first person to ski in Antarctica on the Larsen Ice Shelf which was subsequently named after him. Larsen is considered the founder of the Antarctic whaling industry and the settlement at Grytviken on the British-administered island of South Georgia. In 1910, after some years' residence on South Georgia, he took British citizenship. The Norwegian whale factory ship C.A. Larsen was named after him. Carl Anton Larsen was born in Østre Halsen, Tjolling, the son of Norwegian sea captain Ole Christian Larsen and his wife Ellen Andrea Larsen (née Thorsen). His family subsequently relocated to nearby Sandefjord, the home of the Norwegian whaling industry, where at the young age of 9 he went to sea in a small barque with his father chasing seals and trading across the North Atlantic with Britain, returning to go to school during the fall and winter. He continued this for a number of years, until his curiosity for the sea was so strong he enrolled himself in navigation school where he passed the exam for foreign-going mate at the age of 18. Having been to Britain a few times in the previous years he realized the importance of knowing more languages and taught himself English and Spanish. Larsen was eager to get work as an officer on a ship, but due to economic difficulties in Norway at the time, he could not. This was a setback, but he went to work at sea as a cook, learning the importance food played in keeping men happy. He finally got a position aboard the barque Hoppet out of Larvik, as second mate, then first mate and senior officer below the captain. He was 21 and knew he had to study again so he came ashore and soon became a shipmaster. Upon becoming a shipmaster, Larsen a ship of his own. This was more than he could afford so instead, he bought a share of an old barque called the Freden. It was not smooth sailing for Larsen as the barque Freden was all but wrecked after his first voyage. He soon got her fixed, only to be faced with another setback. Nobody had any freight he could carry. This turned out to be a stroke of luck as he decided to go on his first whaling experience, hunting bottlenose whales just off the coast of Norway. Larsen was a born whaler and soon filled the Freden with whales and went on filling her until 1885 when he realized that he could not use the Svend Foyn gun with little chaser-steamers like the modern whalers. It was time for a newer ship. Larsen led an expedition to Antarctica, in command of the Jason, from 1892 through 1894, discovering the Larsen Ice Shelf, the Foyn Coast in Graham Land, as well as King Oscar Land, and Robertson Island. The Jason was a ship Larsen was familiar with as he had been aboard it during the voyage that carried Fridtjof Nansen to Greenland during his east-west crossing in 1888. Later he captained the ship Antarctic, as part of the Swedish Antarctic Expedition of 1901-04. During this mission some of his crew wintered for 10 months at Snow Hill Island, and after his ship was crushed by ice and sank, he and his crew spent the winter of 1903 on Paulet Island, surviving on penguins and seals before being rescued by the Argentine corvette ARA Uruguay. In 1904 Larsen settled on the British island of South Georgia in the Antarctic, starting a new era of whaling. On Christmas Eve, 1904, he produced the first whale oil of the season in the newly built whaling station of Grytviken. With Argentine, Norwegian and British capital he founded the first Antarctic whaling corporation, the Compañía Argentina de Pesca (Argentine Fishing Company). Within a few years the Antarctic was producing about 70% of the world's whale oil. As the manager of Compañía Argentina de Pesca, Larsen organized the construction of Grytviken―a remarkable undertaking accomplished by a team of 60 Norwegians. Larsen also established a meteorological observatory at Grytviken, which from 1905 was maintained in cooperation with the Argentine Meteorological Office under the British lease requirements of the whaling station until these changed in 1949. Larsen had chosen the whaling station's site during his 1902 visit while in command of the ship Antarctic of the Swedish Antarctic Expedition (1901–03) led by Otto Nordenskjöld. Larsen was also instrumental, with his brother, in introducing Reindeer to South Georgia in 1911, as a resource for recreational hunting for the people involved in the whaling industry. Antarctica, great stories from the frozen continent. Australia: Reader's Digest. 1985. ISBN 0-949819-64-6. Alberts, Fred G., ed. (1980). Geographic Names of the Antarctic. Washington: U.S. National Science Foundation. Alexander, Caroline; Hurley, Frank (1998). Endurance. London: Bloomsbury. ISBN 978-0-7475-4123-3. Child, Jack (1988). Antarctica and South American Geopolitics: Frozen Lebensraum. New York: Praeger Publishers. ISBN 978-0-275-92886-5. Mills, William James (2003). Exploring Polar Frontiers A Historical Encyclopedia. London: ABC-CLIO Publishing. ISBN 1-57607-422-6. Rabassa, Jorge; Borla, Maria Laura (2006). Antarctic Peninsula & Tierra del Fuego. London, New York: Taylor and Francis. ISBN 978-0-415-41379-4. Risting, Sigurd (1929). Kaptein C. A. Larsen (in Norwegian). Oslo: Cappelen Akademiske forlag. Riffenburgh, Beau (2006). Encyclopedia of the Antarctic. Vol. 1. London: Taylor and Francis. ISBN 0-415-97024-5. Rubin, Jeff (2008). Antarctica. Lonely Planet Publications. ISBN 1-74104-549-5. Rubin, Jeff (1996). Antarctica: a Lonely Planet Travel Survival Kit. Oakland, CA. : Lonely Planet Publications. ISBN 0-86442-415-9. Stewart, Andrew (1990). Antarctica: An Encyclopedia. 2 vol. set. London: McFarland and Co. ISBN 0-89950-470-1. Villiers, Alan (1956). Pioneers of the Seven Seas. London: Routledge & Paul. "Business: Whales". Time Magazine. May 28, 1934. Retrieved 2009-10-24. Larsen, Carl Anton. "1900 Census for the Municipality of Sandefjord". Norwegian Historical Data Centre. Retrieved 2009-10-24. ^ a b Larsen, Carl Anton. "1900 Census for the Municipality of Sandefjord". Norwegian Historical Data Centre. Retrieved 23 October 2009. ^ Mills, William James (2003). Exploring Polar Frontiers A Historical Encyclopedia. ABC-CLIO. pp. 373–374. ISBN 1-57607-422-6. ^ Riffenburgh, Beau (2006). Encyclopedia of the Antarctic, Vol. 1. Taylor & Francis. p. 584. ISBN 0-415-97024-5. Retrieved 22 October 2009. ^ a b Villiers, Alan (1956). Pioneers of the Seven Seas. Routledge & Paul. pp. 179–80. Retrieved 22 October 2009. ^ Rubin, Jeff (2008). Antarctica. Lonely Planet. p. 40. ISBN 1-74104-549-5. Retrieved 22 October 2009. ^ Antarctica. Sydney: Reader's Digest, 1985, pp. 126–27, 152–59, 296–97, 305. ^ Child, Jack. Antarctica and South American Geopolitics: Frozen Lebensraum. New York: Praeger, 1988, pp. 13–14, 27–28, 72. ^ Lonely Planet, Antarctica: a Lonely Planet Travel Survival Kit, Oakland, CA: Lonely Planet, 1996, pp. 23, 278–79, 307. ^ Stewart, Andrew, Antarctica: An Encyclopedia. London: McFarland and Co., 1990 (2 volumes), p. 558. ^ U.S. National Science Foundation, Geographic Names of the Antarctic, Fred G. Alberts, ed. Washington: NSF, 1980. ^ Robert K. Headland, The Island of South Georgia, Cambridge University Press, 1984. Cumberland Bay is a bay, 4 miles (6.4 km) wide at its entrance between Larsen Point and Barff Point, which separates into two extensive arms that recede inland 9 miles (14 km) along the northern coast of South Georgia. It was discovered and named in 1775 by a British expedition under James Cook. Flensing is the removing of the blubber or outer integument of whales, separating it from the animal's meat. Processing the blubber into whale oil was the key step that transformed a whale carcass into a stable, transportable commodity. It was an important part of the history of whaling. The whaling that still continues in the 21st century is both industrial and aboriginal. In aboriginal the blubber is rarely rendered into oil, although it may be eaten as muktuk. Viktor Esbensen was a Norwegian mariner known for exploring the Antarctic region together with his father-in-law Carl Anton Larsen, looking to make a living from whaling. He was killed when his ship was sunk in World War II. The Viola is a steam trawler built in 1906 at Hull. She is the oldest surviving steam trawler in the world. During her long career, she was known as HMT Viola, Kapduen, and Dias. She is currently beached at Grytviken in South Georgia, though there are currently plans afoot to return her to Hull. 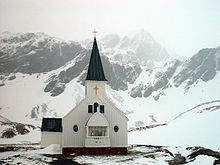 Grytviken Church, also known as the Whalers Church, and as the Norwegian Lutheran Church, was built in 1913 in Grytviken, South Georgia. The church was part of the Church of Norway for a century from 1913 to 2013. It was formally handed over to the United Kingdom in 2013, and is now part of the Anglican Communion Diocese of the Falkland Islands. Petrel was a whaler, built in Oslo, in 1928, in operation in the waters around Antarctica for over three decades.